Excessive production of aldosterone leads to the development of hypertension and cardiovascular disease by generating an inflammatory state that can be promoted by T cell immunity. Because nature and intensity of T cell responses is controlled by dendritic cells (DCs), it is important to evaluate whether the function of these cells can be modulated by aldosterone. In this study we show that aldosterone augmented the activation of CD8+ T cells in a DC-dependent fashion. Consistently, the mineralocorticoid receptor was expressed by DCs, which showed activation of MAPK pathway and secreted IL-6 and TGF-β in response to aldosterone. In addition, DCs stimulated with aldosterone impose a Th17 phenotype to CD4+ T cells, which have recently been associated with the promotion of inflammatory and autoimmune diseases. Accordingly, we observed that aldosterone enhances the progression of experimental autoimmune encephalomyelitis, an autoimmune disease promoted by Th17 cells. In addition, blockade of the mineralocorticoid receptor prevented all aldosterone effects on DCs and attenuated experimental autoimmune encephalomyelitis development in aldosterone-treated mice. Our data suggest that modulation of DC function by aldosterone enhances CD8+ T cell activation and promotes Th17-polarized immune responses, which might contribute to the inflammatory damage leading to hypertension and cardiovascular disease. Aldosterone is widely known as a mineralocorticoid hormone involved in the regulation of blood electrolyte concentration and physiological volume homeostasis (1). These processes require the interaction of aldosterone and the mineralocorticoid receptor (MR), an intracellular receptor expressed by cells of target organs, such as kidneys. However, this traditional view of aldosterone activity has been challenged during the past few years, with numerous reports showing MR expression in tissues other than kidneys, such as blood vessels and the brain (2, 3). Moreover, both experimental and clinical data indicate that aldosterone can promote inflammatory damage to the heart, kidneys, and vasculature (4, 5). In vitro and in vivo studies have shown that MR activation by aldosterone induces oxidative stress, vascular inflammation, and an increase in the expression of inflammatory biomarkers, such as fibrinogen and plasminogen activator inhibitor-1 (6, 7). It is possible that these proinflammatory actions induced by aldosterone can contribute to progressive renal dysfunction and congestive heart failure (8, 9). Consistent with this notion, infiltration of mononuclear leukocytes in the perivascular space occurs during early stages of ventricular dysfunction and heart failure (10). In primary aldosteronism (PAL), a highly prevalent form of secondary hypertension (11–13), the pathologic effects triggered by the excessive secretion of aldosterone are partially due to the promotion of myocardial and vascular fibrosis (14, 15), the induction of oxidative stress (16), perivascular inflammation, and the infiltration of APCs (17). Furthermore, it has been recently shown that T cells are required for the induction of hypertension by angiotensin II, a hormone that regulates blood pressure by promoting aldosterone production and directly affecting blood vessel constriction (1, 18). Although the participation of adaptive immunity in the genesis of hypertension and the activation of peripheral immune cells during PAL has been documented (19), the ability of aldosterone to modulate APC-T cell interactions and the initiation of adaptive immunity remains unclear. Among all APCs, dendritic cells (DCs) have the unique capacity to efficiently prime and modulate naive CD4+ and CD8+ T cells during an adaptive immune response (20). DCs with an immature phenotype can present self-Ags on MHC molecules and induce Ag-specific T cell anergy or tolerance (21). In contrast, maturation induced by recognition of pathogen-associated molecular patterns (i.e., bacterial LPS or CpG DNA) empowers DCs to promote the differentiation of naive CD8+ and CD4+ T cells, into cytotoxic T cells and polarized Th cells, respectively (22–24). It is thought that alterations in the function of DCs can contribute to the loss of tolerance to self constituents that can lead to autoimmune disorders (25). Because of the key role of DCs in modulating immunity and tolerance, their function must be strictly regulated to prevent autoimmune or inflammatory damage (26). The development of autoimmune and inflammatory disorders has been shown to be influenced by a recently described subset of CD4+ T cells that are characterized by the secretion of IL-17 (Th17 cells) (27). Several autoimmune disorders that were initially thought to be driven by Th1 T cell responses, such as rheumatoid arthritis and multiple sclerosis, are now considered to be triggered by Th17 immune responses (28, 29). Considering that Th17 cells can contribute to autoimmunity, their development, proliferation, and survival require appropriate regulation (30). It has been shown that CD4+ T cells can be induced to polarize toward a Th17 phenotype by Ag-loaded DCs (31, 32). Th17 polarization in mice depends on the presence of two cytokines, TGF-β and IL-6 (33, 34), both of which can be produced by DCs. In this study, we have evaluated the capacity of aldosterone to modulate the activation of Ag-specific CD8+ and CD4+ T cells by DCs. Our data show that DCs express the MR and that receptor stimulation by aldosterone leads to p38 and JNK phosphorylation, along with IL-6 and TGF-β secretion and diminished programmed death-ligand 1 (PD-L1) expression. In addition, aldosterone increases the capacity of DCs to prime CD8+ T cells and induce Th17 polarization of CD4+ T cells. The effect of aldosterone on T cell activation and polarization is strictly mediated through DCs, because no modulation of T cell activation is observed in APC-independent T cell activation assays. Consistent with these data, aldosterone can exacerbate clinical symptoms associated with experimental autoimmune encephalomyelitis (EAE) and promote the production of IL-17 by myelin-specific T cells. All activating effects of aldosterone on DC function and T cell activation and polarization could be blocked by eplerenone, an MR inhibitor and selective aldosterone blocker. Similarly, spironolactone, a competitive and nonselective aldosterone inhibitor widely used in PAL patients, also prevented aldosterone-mediated effects on DCs, suggesting an MR-dependent effect. Consistently, spironolactone is able to significantly diminish the severity of EAE in mice receiving the mineralocorticoid hormone. Our results suggest that aldosterone enhances CD8+ T cell activation and promotes Th17 polarization of CD4+ T cells by directly modulating DC function. Consequently, aldosterone treatment enhances the severity of a Th17-mediated autoimmune disease, suggesting that vascular inflammation caused by aldosterone could be in part mediated by an exacerbated Th17 immune response. Six- to 8-wk-old female C57BL/6 mice were obtained from The Jackson Laboratory (Bar Harbor, ME). OVA-specific OT-I and OT-II transgenic mice strains expressing specific TCRs for H-2Kb/OVA257–264 and I-Ab/OVA323–339 respectively, were obtained from Dr. R. Steinman (The Rockefeller University, New York, NY). All mice were maintained and manipulated according to institutional guidelines at the specific pathogen free facility of the Pontificia Universidad Católica de Chile. Stock solutions of aldosterone (10 mM), spironolactone (5 mM; Sigma-Aldrich, St. Louis, MO) and eplerenone (5 mM; provided by Pharmacia, Peapack, NJ) were prepared in ethanol. Working solutions were freshly prepared in RPMI 1640 culture medium without FBS immediately before each experiment. Spironolactone or eplerenone were added to cultures at a final concentration of 5 μM, 10 min before aldosterone treatment. Aldosterone was added to cultures at a final concentration of 100 nM. Controls with vehicle (ethanol) were included when applicable. Myelin oligodendrocyte glycoprotein (MOG)-derived peptide MOG35–55 was synthesized as described previously (21). Bone marrow-derived DCs from C57/BL6 were prepared as previously described (22, 24, 35). DCs were grown in RPMI 1640 medium supplemented with 5% heat-inactivated FBS, supplemented with 20 ng/ml recombinant mouse GM-CSF (PeproTech, Rocky Hill, NJ) (35). On day five, DCs were treated with vehicle, aldosterone, aldosterone plus eplerenone, aldosterone plus spironolactone, or only inhibitors; 10 min later, cells were pulsed with 12.5, 25, or 50 μg/ml OVA. Twenty-four hours later, DCs were washed three times, and viability was evaluated by trypan blue exclusion. Next, cells were cocultured with either 1 × 105 OT-I T cells in the presence of vehicle, aldosterone alone, or aldosterone plus spironolactone, or 1 × 105 OT-II T cells in medium alone. After 20 h, T cells were double-stained with PE-conjugated anti-CD69 mAb (clone H1.2F3; BD Pharmingen, San Diego, CA) plus FITC-conjugated anti-CD4 mAb (clone H129.19; BD Pharmingen) or FITC-conjugated anti-CD8 mAb (clone 53-6.7; BD Pharmingen), and CD69 expression was determined by using a FACSCalibur flow cytometer (BD Biosciences, San Jose, CA). Data were analyzed by using WinMDI software (downloaded from http://facs.scripps.edu). IL-2 and IFN-γ secretion was determined by ELISA as previously described (36). For IL-17 determination, DCs were cocultured with 1 × 105 OT-II T cells for 48 h, and culture supernatants were quantified by ELISA (Capture mAb: clone TC11-18H10; detection mAb: clone TC11-8H4; BD Pharmingen). For intracellular detection of IL-17, purified CD4+ T cells were cocultured with DCs previously treated with vehicle, aldosterone alone, or aldosterone plus spironolactone by 72 h. During the last 6 h, cells were restimulated with PMA (10 ng/ml; Sigma-Aldrich), ionomycin (1 mg/ml; Calbiochem, San Diego, CA) and brefeldin A (5 mg/ml; Sigma-Aldrich). Cells were washed and stained with FITC-conjugated anti–IL-17 (clone eBio17B7, eBiosience, San Diego, CA) in permeabilization buffer (PBS/BSA 3%/Saponin 0.5%). In some experiments, purified CD8+ T cells were treated during 20 h with vehicle, aldosterone, aldosterone plus eplerenone, aldosterone plus spironolactone, or only the MR inhibitors; washed three times with PBS; and cocultured with DCs pulsed with 12.5, 25, or 50 μg/ml OVA, during 20 h. T cell activation was analyzed by IL-2 secretion as described above. Alternatively, in other assays, DCs pulsed with 12.5, 25, or 50 μg/ml OVA and treated during 24 h with vehicle, aldosterone, aldosterone plus eplerenone, aldosterone plus spironolactone, or only the MR inhibitors, were washed and cocultured with purified CD8+ T cells during 20 h. T cell activation was analyzed by IL-2 secretion and CD69 expression, as described above. For anti-CD3ε T cell activation, 96-well cell culture plates were coated overnight at 4°C with increasing concentrations of anti-mouse CD3ε mAb (clone 145-2C11; BD Pharmingen). After washing and blocking with PBS-BSA 3%, 1 × 105 OT-I T cells per well were plated and treated with vehicle, aldosterone alone or aldosterone plus spironolactone, or eplerenone for 20 h. After this time, surface CD69 expression and IL-2 secretion were determined as described previously. For Ab blocking experiments, anti–IL-6 (Capture mAb: clone MP5-20F3) and anti-TGF-β (Capture mAb: clone A75-2) were added during the coculture at a concentration of 3 μg/ml. Bone marrow DCs at day five were untreated or treated with aldosterone plus eplerenone, aldosterone plus spironolactone, or only the inhibitors for 24 h. Afterward, DCs were labeled with 0.5 μM CMTMR-Orange (Molecular Probes, Eugene OR; Invitrogen) in RPMI 1640 medium (Invitrogen-Life Technologies, Carlsbad, CA), 5% FBS (Biological Industries, Beit Haemek, Israel) at 37°C for 15 min, washed twice, and pulsed with OVA. In parallel, T cells were labeled with 1 μM BODIPY FL C5-Ceramide for 30 min at 37°C (Molecular Probes, Invitrogen). DCs and T cells were seeded into microchambers (Lab-Tek Chamber coverglass; Nalge Nunc International, Rochester, NY) previously coated with poly-d-lysine (Sigma-Aldrich). After a 2-h coculture, cell-derived fluorescence was registered on a FluoView FV1000 Confocal Microscope (60× oil objective, NA 1.35; Olympus, Melville, NY). To evaluate immunologic synapse assembly between T cells and DCs, at least 50 randomly selected fields per treatment were scored visually, counting the number of T cells with Golgi apparatus polarized toward DCs within total DC-T cell conjugates. A minimum of 500 conjugates were analyzed per treatment in three independent experiments. Protein extracts from kidney, B16, bone marrow-derived DCs, or purified CD4+ or CD8+ T cells were obtained using Totex lysis buffer (20 mM HEPES, 350 mM NaCl, 20% glycerol, 1% Nonidet P-40, 1 mM MgCl2, 0.5 mM EDTA, 0.1 mM EGTA, 1 mM DTT, 0.1% PMSF, 0.1% aprotinin). Proteins were denatured at 95°C for 10 min, and 25 μg of protein were loaded on a 12% SDS polyacrylamide gel and electro-blotted onto a nitrocellulose membrane. Membranes were blocked overnight at 4°C with PBS containing 0.2% Tween 20 and 10% fat-free milk, washed twice with PBS-0.2% Tween 20, and incubated with MCR (N-17; Santa Cruz Biotechnology, Santa Cruz, CA) at 1:200 in 5% nonfat milk PBS. Later, HRP-conjugated anti-mouse Ab was added at a 1:2000 dilution (GIBCOBRL Life Technologies, Grand Island, NY), washed and developed using Supersignal West Pico stable peroxide solution (Pierce WestPico Super Signal; Pierce Biotechnology, Rockford, IL). For intracellular staining, DCs, kidney, B16, and purified CD4+ or CD8+ T cells, were washed twice with PBS and fixed for 10 min at 4°C in 4% paraformaldehyde in PBS (Fluka, Deisenhofen, Germany). After washing, cells were permeabilized (PBS/BSA 3%/Saponin 0.5%) for 10 min and then stained for MR with an unlabeled primary mouse polyclonal anti–MR-derived peptide METKGYHSLPEGLDMERR [kindly provided by Dr. Gomez-Sanchez (37)] and a secondary polyclonal FITC-conjugated goat anti-mouse Ab (BD Pharmingen; catalog number 555988), both for 1 h at 4°C in permeabilization buffer. Real-time PCR reactions were performed using a Strategene Mx300P thermal cycler (Stratagene, La Jolla, CA). Briefly, cDNAs amplified out of total RNA from kidney cells, B16 cells, bone marrow-derived DCs, and purified CD4+ or CD8+ T cells were tested for amplification of MR, using the following primers (5′to 3′): forward TAGTCGGTCTGGGATTTTGC and reverse AGTGTGGAGGACCTGTGACC. PCR amplification of the 18S ribosomal RNA was used as an internal control. Reaction volume was 20 μl, containing 0.5 μmol/l of primers, 2.0 U Taq polymerase (MBI Fermentas, Vilnius, Lithuania), PCR buffer, 0.2 mmol/l 2'-deoxynucleoside 5'-triphosphate, 3.5 mmol/l MgCl2, 1/200,000 dilution of SYBR Green (Molecular Probes-Invitrogen, Carlsbad, CA), 2 μl of template cDNA. To confirm amplification specificity, PCR products were subjected to a melting curve program. Abundance of MR mRNA was determined from standard curves (correlation coefficient ≥ 0.98). The results are expressed as the ratio of the MR amount relative to the amount of 18S for each sample, measured in triplicates. DCs were treated with vehicle, aldosterone, or aldosterone plus spironolactone for 24 h, and then double-stained with allophycocyanin-conjugated anti-CD11c mAb (clone HL3; BD Pharmingen) plus FITC-conjugated anti-CD80 mAb (clone 16-10A1; BD Pharmingen) or FITC-conjugated anti-CD86 mAb (clone GL1; BD Pharmingen), fixed with 1% paraformaldehyde in PBS, and analyzed by FACS. PD-L expression on DCs was determined using PE-conjugated anti–PD-L1 (clone MIH5; BD Pharmingen) mAb and anti–PD-L2 (clone TY25; BD Pharmingen) mAb. DC supernatants were analyzed for the secretion of IL-6 (capture mAb: clone MP5-20F3; detection mAb: clone MP5-32C11; BD Pharmingen); IL-10 (capture mAb: clone JES5-2A5; detection mAb: clone SXC-1; BD Pharmingen) IL-12 (capture mAb: clone 9A5; detection mAb: clone C17.8; BD Pharmingen) and TGF-β (capture mAb: clone A75-2; detection mAb: clone A75-3 ; BD Pharmingen) by cytokine ELISA, as previously described (38). DCs were treated with vehicle, aldosterone, or aldosterone plus spironolactone for 10 min. As a positive control, cells were treated with 1 μg/ml LPS (Sigma-Aldrich). Cells were fixed in 2% formaldehyde at 37°C for 10 min and permeabilized in 90% methanol at −20°C for 3 h. DCs were then washed three times and resuspended in blocking buffer (2% inactivated FBS, 0.05% NaN3 in PBS). Each sample was separated in three equal aliquots and stained with AlexaFluor488-conjugated anti-diphosphorylated ERK 1/2 mAb (clone 20a; BD Pharmingen), AlexaFluor488-conjugated anti-diphosphorylated p38 mAb (clone 36/p38; BD Pharmingen) or unconjugated anti-diphosphorylated JNK1 mAb (Santa Cruz Biotechnology, catalog number sc12882). In addition, all samples were stained with PE-conjugated anti-CD11c mAb by incubating at 4°C for 1 h. Cells were washed twice with blocking buffer and resuspended in blocking buffer. Samples stained with unconjugated anti-diphosphorylated JNK1 were incubated with FITC-conjugated donkey anti-goat IgG (Santa Cruz Biotechnology, catalog number sc2024) at 4°C for 1h. Some samples were stained with FITC-conjugated donkey anti-goat IgG, but without unconjugated anti-diphosphorylated JNK1 as a negative control. Cells were washed twice and resuspended in blocking buffer. Fluorescence for diphospho ERK1/2-, diphospho p38- and diphospho JNK1-labeling were analyzed in the CD11c+ gated population by FACS. Six- to 8-wk-old female C57BL/6 mice were injected s.c. in the flank with 50 μg MOG35–55 peptide emulsified in CFA (Invitrogen, Carlsbad, CA) supplemented with heat-inactivated Mycobacterium tuberculosis H37 Ra (Difco Laboratories, Detroit, MI). In addition, mice received i.p. injections of 500 ng of Pertussis toxin (Calbiochem, La Jolla, CA) at the time of sensitization and 48 h later. Clinical signs of disease were usually seen between days 15 and 18 after sensitization and assessed daily according to the following scoring criteria: 0, no detectable signs of EAE; 1, flaccid tail; 2, hind limb weakness or abnormal gait; 3, complete hind limb paralysis; 4, paralysis of fore and hind limbs; and 5, moribund or dead. To prevent unnecessary animal suffering, mice severely affected by the disease were euthanized with the supervision of a veterinarian. The effect of aldosterone on the anti-myelin response causing EAE was evaluated using the MR agonist deoxycorticosterone acetate (DOCA), which is characterized by longer plasma half-lives, as compared with aldosterone (39). EAE-induced mice were injected s.c. twice per week with either DOCA (0.75 mg/kg body weight) in olive oil (total volume, 100 μl) or vehicle alone. All treatments started 2 d after MOG sensitization and continued throughout the entire experiment. All groups were paired and fed with a standard rodent diet (3 g/d; Rodent Purified Diet; Dyets, Bethlehem, Pennsylvania). Animals treated with spironolactone received identical food pellet supplemented with 1.8 mg spironolactone per mouse daily. Treated and control mice were clinically evaluated on a daily basis. DOCA doses used were well tolerated by mice, and no significant increase in blood pressure was observed as determined by the tail cuff method in conscious animals (data not shown). Serum samples from mice were obtained at days 14 and 21 after sensitization with MOG35–55 peptide and analyzed for the presence of MOG-specific IgG by ELISA, as previously described (40). ELISA plates (BD Biosciences) were coated at 4°C overnight with 50 μl of 10 μg/ml MOG35–55 peptide in PBS (pH 7.2) and blocked with PBS-BSA 1% for 2 h at room temperature. Serum samples were diluted in PBS-BSA 1% starting at dilution 1:100 and incubated for 3 h at room temperature. IgG was detected using a rabbit anti-mouse IgG Ab conjugated to horseradish peroxidase (GE Healthcare, Little Chalfont, Buckinghamshire, U.K.). After washing, 3,3′,5,5′ tetramethylbenzidine substrate (Sigma-Aldrich) was added, and absorbance was measured on a microplate reader at an optical density of 450 nm. Transcardial perfusion was performed on anesthetic zed mice with 20 ml sterile PBS to clear all vascular blood cells in the CNS. Immediately after perfusion, brains and spinal cords were removed by dissection in a laminar flow unit placed on ice-cold PBS supplemented with 2 mM EDTA. Tissues were forced through 100-mesh stainless steel screens to obtain single-cell suspensions. Cells were then pelleted by centrifugation at 1500 rpm for 10 min at 4°C and subsequently separated by centrifugation (500 × g) at 24°C on a 0–70% discontinuous Percoll gradient (Pharmacia, Piscataway, NJ). Live cells were collected, washed twice by centrifugation, and used for T cell activation assays. Cell suspensions were obtained from draining lymph nodes and the CNS on day 21 after EAE induction from control and treated mice and cultured (5 × 105 cells/well) in RPMI 1640 containing 5% FCS with increasing concentrations of MOG35–55 peptide. Cells from lymph nodes and CNS-infiltrating mononuclear cells were incubated at 37°C in 96-well round bottom plates for 48 h or 16 h, respectively. IL-2, IFN-γ, and IL-17 release or IL-17 intracellular staining, respectively in response to MOG35–55 peptide, were determined as previously described (21). For IL-17 intracellular staining, cells were restimulated with PMA (10 ng/ml; Sigma-Aldrich), ionomycin (1 mg/ml; Calbiochem) and brefeldin A (5 mg/ml; Sigma-Aldrich) and stained with anti–IL-17, as described above. The following Ab pairs were used for detection of IL-2 (capture mAb: clone JES6-1A12; detection mAb: clone JES6-5H4, BD Pharmingen), IFN-γ (capture mAb: clone R4-6A2; detection mAb: clone XMG1.2; BD Pharmingen) and IL-17 (capture mAb: clone TC11-18H10; detection mAb: clone TC11-8H4; BD Pharmingen). For measurement of IL-17 transcripts, CNS tissues were homogenized in Trizol reagent (Invitrogen). Total RNA samples were treated with DNAse I, according to manufacturer instructions (DNA-free TM; Ambion, Austin, TX). RNA (0.5 μg) was reverse transcribed with random hexamers (ImProm-IITM Reverse Transcription System; Promega, Madison, WI) and amplified using primers: 5′-TCC AGA AGG CCC TCA GAC TA-3′(sense) and 5′-CTC GAC CCT GAA AGT GAA GG-3′ (antisense). PCR amplification of the 18S ribosomal RNA served as internal control. Values are reported as means ± SEM. Differences between mean values were assessed by one-way ANOVA. To assess differences in EAE clinical scores, Mann-Whitney rank sums two-tailed test was used. To determine whether the ability of DCs to prime naive T cells can be modulated by aldosterone, OVA-pulsed DCs were treated with aldosterone and cocultured with OVA-specific T cells in the presence of aldosterone. We observed that aldosterone-enhanced priming of CD8+ T cells by DCs, as shown by upregulation of the early activation marker CD69 and secretion of IL-2 by T cells, compared with DCs pulsed with OVA alone (Fig. 1A, 1B). 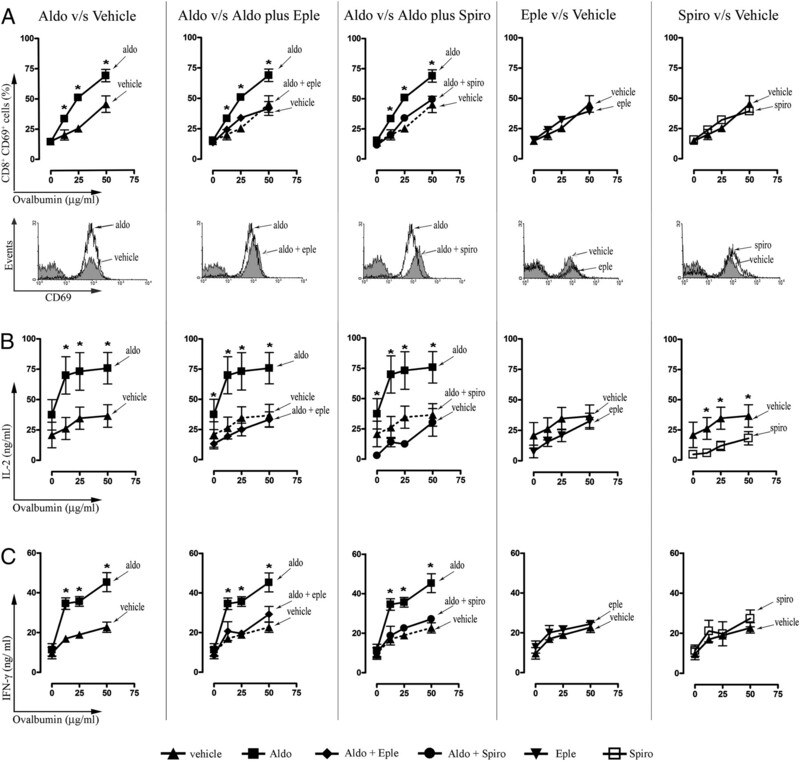 Furthermore, aldosterone increased IFN-γ secretion by OVA-specific CD8+ T cells (Fig. 1C). The enhancing effect of aldosterone on DC-mediated priming of CD8+ T cells was dose dependent, because activation parameters showed a positive correlation with increasing concentrations of aldosterone (Fig. 2). To control the effect of endogenous steroids contained in FBS, we performed a control experiment using media without FBS, and we did not find any effect of endogenous steroids in the parameters determinate (data not shown).The notion that the MR receptor is required for the enhancement of CD8+ T cell priming by aldosterone-treated DCs was supported by the observation that this phenomenon was blocked by two MR-specific inhibitors: spironolactone, a competitive inhibitor, and eplerenone, an MR antagonist (Fig. 1). In addition, we observed that direct treatment with spironolactone alone significantly inhibited activation of CD8+ T cells, as measured by IL-2 secretion. These results suggest that MR signaling could mediate aldosterone-induced enhancement on the capacity of DCs to prime CD8+ T cells. Aldosterone enhances CD8+ T cells activation by DCs. DCs were pulsed with different amounts of OVA protein, treated with vehicle, 100 nM aldosterone, 100 nM aldosterone plus 5 μM spironolactone, 100 nM aldosterone plus 5 μM eplerenone, or with the inhibitors alone, and then cocultured with CD8+ OT-I T cells, as described in Materials and Methods. A, Representative histograms for CD69 expression in T cells cultured with OVA-loaded DCs (25 μg/ml).After 20 h, CD69 expression (A) and IL-2 (B) release by T cells were determined. C, After 36 h, INF-γ release by T cells was determined. *p < 0.05 by one-way ANOVA. Enhancement of CD8+ T cell activation by DCs is dependent on aldosterone concentration. DCs were pulsed with 50 μg/ml OVA, treated with vehicle or treated with different amounts of aldosterone, and cocultured with CD8+ OT-I T cells. After 20 h, CD69 expression and IL-2 release by T cells were determined. Left panel, Expression of CD69 by CD8+ T cells. Right panel, IL-2 release by T cells. Aldosterone concentrations are shown as log of molarity. Data are means ± SEM of triplicates from at least two independent experiments. *p < 0.05; **p < 0.01 by one-way ANOVA. Considering that in the experiments described above, both DCs and T cells could be influenced by aldosterone, we assessed whether this hormone could directly modulate T cell priming. To evaluate this hypothesis, we used three different approaches. First, T cells were stimulated with immobilized anti-CD3ε and exposed to vehicle, aldosterone alone, or aldosterone plus spironolactone or eplerenone for 24 h. Although no significant effect on anti–CD3ε-induced T cell activation was observed in response to aldosterone, as determined by CD69 upregulation and IL-2 release, cotreatment with spironolactone significantly suppressed IL-2 release by CD3ε-stimulated T cells (Supplemental Fig. 1A). This effect was not observed when T cells were cotreated with the other MR-specific antagonist eplerenone (Supplemental Fig. 1A). As a second approach, T cells were treated directly with aldosterone before culturing them with OVA-pulsed DCs. Similar to the findings described above, no significant increase on IL-2 secretion was induced by direct exposure of T cells to aldosterone (Supplemental Fig. 1B). However, spironolactone alone was able to inhibit IL-2 secretion by T cells. As a third approach, DCs pulsed with OVA were treated either with aldosterone, aldosterone plus spironolactone, aldosterone plus eplerenone or with the inhibitors alone for 24 h, washed, and cocultured with purified T cells during 24 h. Consistently with data shown above, in these assays aldosterone treatment caused an enhancement of CD8+ T cell activation (Fig. 3A). Furthermore, the enhancement of T cell activation by aldosterone was also suppressed by eplerenone and spironolactone, suggesting an MR-dependent effect in these assays. Together, these data suggest that aldosterone-induced enhancement of T cell activation is mediated through DCs and not caused by a direct effect on T cell function. Aldosterone directly increases the capacity of DCs to activate T cells. DCs were pulsed with different amounts of OVA protein, treated with either vehicle, 100 nM aldosterone, 100 nM aldosterone plus 5 μM spironolactone, 100 nM aldosterone plus 5 μM eplerenone, or the inhibitors alone, washed, and cocultured with purified CD8+ (A) or CD4+ (B) T cells during 20 h. CD69 expression and IL-2 release by T cells were determined. Data are means ± SEM of triplicates from three independent experiments. *p < 0.05 by one-way ANOVA. Because the enhancement of CD8+ T cell activation by aldosterone appears to be mediated by modulating DC function, we decided to directly evaluate the capacity of aldosterone to modulate DC-T cell interactions. T cell activation is mediated by TCR engagement by peptide-loaded MHCs on the DC surface and the formation of a supramolecular structure at the DC-T cell interface, known as immunological synapse (41). This process is characterized by the early relocation of the secretory machinery of the T cell toward the DC surface. Thus, we tested whether the enhancement of CD8+ T cell activation induced by aldosterone could be due to an increased T cell polarization toward hormone-treated DCs. With this aim, Golgi apparatus polarization toward the cell-cell contact site was analyzed using confocal microscopy on OVA-specific CD8+ T cells stimulated with OVA-pulsed DCs that were treated with aldosterone. As expected, although no significant T cell Golgi polarization was observed in conjugates formed with unpulsed DCs, a major fraction of conjugates showed T cell Golgi apparatus polarization toward OVA-pulsed DCs (Fig. 4). However, no differences in T cell polarization were observed when conjugates were formed with OVA-pulsed DCs treated with aldosterone, compared with OVA-pulsed DCs treated with vehicle (Fig. 4). Surprisingly, a marked inhibition of T cell polarization was observed in conjugates containing OVA-pulsed DCs that were treated with aldosterone and spironolactone or spironolactone alone (Fig. 4). This phenomenon was not due to a decreased Ag uptake in spironolactone-treated DCs, as shown by Dextran-FITC phagocytosis assays (Supplemental Fig. 2A). These data suggest that the aldosterone-induced enhancement of CD8+ T cell activation is not mediated by an increase in T cell-DC synapse assembly. T cell polarization toward OVA-pulsed DCs is not affected by aldosterone. OVA-pulsed DCs were treated for 24 h with vehicle, 100 nM aldosterone or 100 nM aldosterone plus 5 μM spironolactone, or 100 nM aldosterone plus 5 μM eplerenone or with the inhibitors alone, then stained with CMTMR-Orange (red) and conjugated with OT-I T cells stained with BODIPY FL C5-Ceramide (green) at a 1:1 ratio. Unpulsed DCs treated with vehicle alone were included as controls. After incubating for 2 h at 37°C, Golgi apparatus polarization toward DCs (A, arrowheads) was registered by confocal microscopy, as described in Materials and Methods. Scale bars are equal to 2 μm. Quantitative analysis was performed by double-blinded scoring of random fields (B). Data are means ± SEM from three independent experiments. *p < 0.05 by one-way ANOVA. Considering that DCs are required for the aldosterone-induced enhancement of CD8+ T cell activation, we evaluated whether DC function is altered in response to this hormone. First, MR expression by DCs was demonstrated by western blot, real-time PCR, and flow cytometric analyses (Fig. 5A–5C), suggesting that binding of aldosterone to this receptor could influence DC function. To evaluate the Ab specificity, mouse B16 melanoma cells were included as a negative control (Fig. 5A–5C). In contrast, no significant MR expression was detected for CD8+ and CD4+ T cells, compared with DCs or positive controls (Fig. 5A–5C). Next, we tested whether aldosterone could induce DC maturation by measuring the surface expression of CD80, CD86, and CD40, three costimulatory molecules that are required for efficient T cell activation (42). No differences in the expression of these molecules were found (Supplemental Fig. 2A). Furthermore, no difference in the phagocytic capacity of DCs, another parameter of DC maturation, was observed in response to aldosterone, as determined by Dextran-FITC internalization (Supplemental Fig. 2A). Aldosterone promotes MAPK signaling and IL-6 and TGF-β secretion by DCs through an MR-dependent pathway. Western blot detection (A) real-time PCR amplification (B) or flow cytometric detection (C) for MR expression on DCs. Homogenates from kidney (lane 2) bone marrow DCs (lane 3), CD4+ T cells (lane 4), and CD8+ T cells (lane 5) were analyzed. B16 cells were included as a negative control. D and E, DCs were treated with vehicle, 100 nM aldosterone, or 100 nM aldosterone plus 5 μM spironolactone for 24 h. Expression of costimulatory molecule PD-L1 (inset: histogram of PDL-1 expression on CD11c+ DCs) (D) and IL-6 and TGF-β release (E) by CD11c+ DCs was evaluated by FACS and ELISA, respectively. F, DCs were treated with vehicle, aldosterone, or aldosterone plus spironolactone for 10 min, and the phosphorylation of ERK1/2, p38 and JNK kinases was determined in CD11c+ cells by FACS. Representative histograms for MAPK phosphorylation in CD11c+ cells (top). Percentage of MAPK phosphorylation in DCs (bottom). Data are means ± SEM from at least four independent experiments. *p < 0.05; **p < 0.01; ***p < 0.001, one-way ANOVA. Because no differences in the expression of costimulatory molecules by DCs were observed in response to aldosterone, we evaluated whether this hormone can modulate the expression of PD-L1 and PD-L2, two ligands that suppress CD8+ T cell activation (43, 44). Our results showed that aldosterone significantly decreased the expression of PD-L1 on DCs. This effect was completely suppressed by spironolactone (Fig. 5D). In contrast, no differences in PD-L2 surface expression were observed in response to aldosterone (data not shown). Spironolactone alone did not affect expression of PD-L1 or PD-L2 (data not shown). These results are consistent with the notion that enhancement of the capacity of DCs of activating CD8+ T cells caused by aldosterone can be partially mediated by reduced PD-L1 expression on DCs. Next, we evaluated the secretion of cytokines by DCs in response to aldosterone and observed significant amounts of IL-6 (237.6 ± 33.6 versus 98.9 ± 6.8 pg/ml; p < 0.05) and TGF-β (101.6 ± 36.8 versus 33.7 ± 6.5 pg/ml; p < 0.05), as compared with untreated DCs (Fig. 5E). In contrast, no significant secretion of IL-10 (93.1 ± 24.1 versus 90.1 ± 35.3 pg/ml; NS) or IL-12 (91.6 ± 19.4 versus 108.1 ± 23.1 pg/ml; NS) by DCs was observed in response to aldosterone (Supplemental Fig. 2B). In addition, spironolactone inhibited the induction of IL-6 (237.6 ± 33.6 versus 92.7 ± 6.9 pg/ml; p < 0.05) and TGF-β (101.6 ± 36.8 versus 36.6 ± 7.5 pg/ml; p < 0.05) secreted in response to aldosterone, suggesting that this process required MR signaling on DCs (Fig. 5E). Our data are consistent with the notion that aldosterone is able to promote the concerted secretion of IL-6 and TGF-β by DCs in an MR-dependent fashion. To characterize the mechanism involved in the modulation of DC function by aldosterone, we assessed whether this hormone could promote the activation of MAPKs ERK 1/2, p38, and JNK in DCs. There is evidence showing that aldosterone action on target cells can be in part mediated by MAPK signaling (45). In response to aldosterone, increased p38 phosphorylation (mean fluorescence intensity [MFI], 12.4 ± 1.2 versus 5.4 ± 0.8; p < 0.05) and JNK phosphorylation (MFI, 27.7 ± 2.4 versus 18.4 ± 1.7; p < 0.05) was observed in DCs compared with vehicle, which could be partially suppressed by spironolactone-mediated blockade of the MR (p38 MFI, 4.6 ± 0.5 versus 12.4 ± 1.2; p < 0.05; JNK MFI, 21.9 ± 3.9 versus 27.7 ± 2.4; NS; Fig. 5F). In contrast, no significant phosphorylation of ERK 1/2 was induced by aldosterone in DCs (MFI, 5.2 ± 1.4 versus 5.8 ± 0.7; NS; Fig. 5F), implying that aldosterone activates only a specific fraction of the MAPK cascade in DCs. These data support the notion that aldosterone modifies DC function in an MR-dependent mechanism by stimulating p38 and JNK MAPKs. Because the secretion of IL-6 and TGF-β by DCs has been shown to promote Th17 polarization of naive CD4+ T cells (46), we investigated whether the capacity of DCs to prime and polarize naive CD4+ T cells toward a Th17 phenotype can be modulated by aldosterone. To test this, OVA-pulsed DCs were treated with aldosterone and cocultured with OT-II T cells. In contrast to what was observed for CD8+ T cells, aldosterone treatment of Ag-pulsed DCs failed to increase activation of CD4+ T cells as measured by CD69 expression and unexpectedly caused a significant reduction of IL-2 secretion by T cells (Fig. 3B, 6A). This effect was reverted by eplerenone but not by spironolactone (Fig. 6A). Furthermore, aldosterone-treated DCs showed an enhanced capacity to promote IL-17 production by OT-II CD4+ T cells, a proinflammatory cytokine produced by Th17 cells, as observed by cytokine secretion and intracellular staining (Fig. 6B, 6C). Aldosterone induction of IL-17 release by CD4+ T cells was suppressed by both MR inhibitors, suggesting that MR signaling in DCs is required to promote a Th17-polarizing phenotype. In addition, Ab blockade of IL-6 and TGF-β secreted by DCs completely suppressed IL-17 release by CD4+ T cells (Fig. 6B). These data support the notion that aldosterone-treated DCs acquire the capacity to induce a Th17 phenotype on Ag-specific CD4+ T cells. Aldosterone-treated DCs enhance IL-17 secretion by CD4+ T cells. DCs were pulsed with different amounts of OVA protein and treated either with vehicle, 100 nM aldosterone, 100 nM aldosterone plus 5 μM spironolactone, 100 nM aldosterone plus 5 μM eplerenone, 100 nM aldosterone plus neutralizing Abs, or with the inhibitors alone. DCs were then cocultured with CD4+ OT-II T cells, as described in Materials and Methods. A, T cell activation was evaluated by CD69 expression (upper panel) and IL-2 release (lower panel) at 24 h. Th17 polarization was evaluated by IL-17 release after 36 h of culture (B) and intracellular cell staining (C) as described in Materials and Methods. 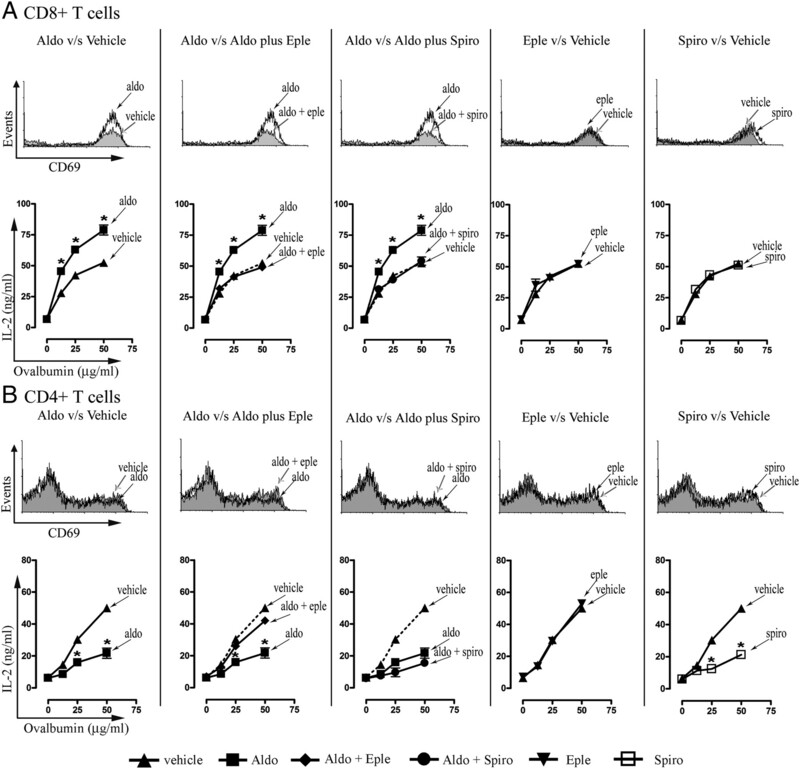 C, Quantitative analyses of CD4+ IL-17+ T cells are shown. Data are means ± SEM from at least three independent experiments. *p < 0.05 aldosterone versus vehicle, one-way ANOVA. To further evaluate the notion that Th17 polarization can be promoted by aldosterone, we tested whether this hormone can enhance the clinical and immunological parameters associated to EAE, a Th17-mediated autoimmune disease (29, 47). Because of its short half-life in plasma, aldosterone was replaced by the more stable mineralocorticoid analog DOCA (39). Control (vehicle-injected) mice showed disease signs 14 d after EAE induction and a disease progression equivalent to previous reports (Fig. 7A) (40). However, a significant enhancement on the severity of EAE was observed in mice treated with DOCA (Fig. 7A). Importantly, combined DOCA and spironolactone treatment delayed EAE onset and significantly reduced the severity and incidence of disease (Fig. 7A). The diminished EAE severity was also observed when mice were treated only with the inhibitor (Fig. 7A). These results suggest that increased DOCA levels lead to an exacerbation of EAE symptoms in mice, which is consistent with the notion that mineralocorticoid promotes Th17 immunity. In addition, our data suggest that spironolactone can work as a suppressor of autoimmune damage in the EAE model. EAE symptoms are exacerbated by DOCA-mediated enhancing of myelin specific-Th17 immunity. Starting 72 h after EAE induction, mice received two s.c. injections per week of either vehicle or DOCA. A group of DOCA-treated mice also received spironolactone orally, as described in Materials and Methods. A vehicle subgroup was also treated with spironolactone. A, Clinical score was determined on a daily basis after EAE-induction. *p < 0.05; *** p < 0.005, Mann-Whitney rank sums two-tailed test. B, CNS-infiltrating T cells, purified as described in Materials and Methods, were stimulated with MOG35–55 peptide during 16 h, restimulated with PMA/ionomicyn and stained with anti–IL-17 Ab. Quantitative analysis of CD4+ IL-17+ T cells are shown. Semiquantitative real-time PCR analysis of IL-17 mRNA expression from 1 gr of total brain is shown on the right. Results were normalized to 18S RNA. C–F, Draining lymph node cell suspensions were obtained from control and DOCA-treated mice 3 wk after EAE induction. IL-17 intracellular staining (C), IFN-γ (D), and IL-2 (E) production in response to MOG35–55 peptide were determined after 72 h of culture. F, To evaluate the anti-myelin Ab response, sera were collected from mice 3 wk after EAE induction. Data are means ± SEM of two independent experiments of 6 mice in each group. # p < 0.05 DOCA versus vehicle, one-way ANOVA. One of the histopathologic features of multiple sclerosis is the focal infiltration of inflammatory cells, such as CD4+ IL-17 + T cells. Thus, we evaluated the frequency of infiltrating Th17 polarized cells in EAE-suffering mice. Consistent with the capacity of aldosterone to promote in vitro Th17 polarization and EAE progression, we observed an increased frequency of infiltrating CD4+ IL-17+ T cells in the CNS of DOCA-treated mice, compared with control animals (Fig. 7B). The observation that spironolactone suppressed the DOCA-mediated enhancement of EAE (Fig. 7B) would suggest an MR-dependent effect of DOCA. No significant infiltration of CD4+ T lymphocytes could be detected in naive mice (Fig. 7B). Consistent with the flow cytometric data, increased levels of IL-17 transcripts were observed in CNS-derived cells from DOCA treated mice (Fig. 7B). These results suggest a direct role of mineralocorticoid hormone in Th17 polarization. Next, to evaluate whether the enhancement on EAE severity observed in DOCA-treated mice was caused by an increase in anti-myelin Th17 cell response, we measured the IL-17, IFN-γ and IL-2 production by lymph node-derived T cells obtained from immunized mice in response to DCs pulsed with an MOG-derived peptide. 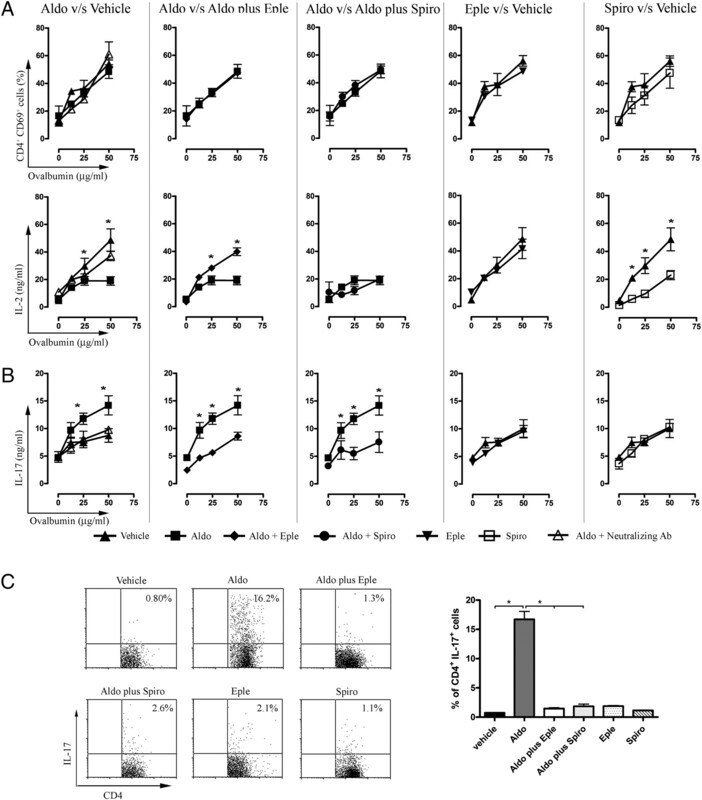 A significant increase in IL-17 secretion and IL-17 intracellular staining was observed for MOG-specific T cells obtained from DOCA-treated mice, as compared with control animals (Fig. 7C). No significant differences in IFN-γ and IL-2 secretion were observed between DOCA and control mice (Fig. 7D, 7E). Accordingly with their exacerbated T cell response to MOG, DOCA-treated mice showed increased anti-MOG IgG titers, as compared with control animals (Fig. 7F). In agreement with the complete EAE suppression observed in mice treated simultaneously with DOCA and spironolactone or spironolactone alone, T cells from these animals secreted no detectable levels of IL-17, IFN-γ, and IL-2 in response to MOG (Fig. 7C–E). These data support the notion that increased MR-agonist levels can enhance the severity of EAE by promoting the expansion of Th17 cells. It has been increasingly acknowledged that aldosterone plays an important role as a mediator of cardiovascular and renal morbidity by promoting perivascular inflammation, reactive oxygen species production, immune complex deposition, and immune cell infiltration (17). However, despite the well-documented involvement of elements of the adaptive immune response in the progression of cardiovascular and kidney damage (6), the direct effect of aldosterone on the activation of adaptive immunity has not yet been reported. In this study, we show that aldosterone can directly increase the capacity of DCs to prime CD8+ T cells, induce Th17 polarization of CD4+ T cells, and enhance EAE development. MR activity in DCs was required for the response to aldosterone, because the effects induced by the hormone were antagonized by the MR inhibitors spironolactone and eplerenone. DCs have the unique ability to prime naive T cells and are essential for the initiation of adaptive immunity (22–24) and for maintaining tolerance to self-constituents (25, 40). Based on the previously reported proinflammatory capacity of aldosterone (19), we decided to study whether this hormone could modulate T cell activation by DCs. We observed an increased priming of CD8+ T cells by DCs in the presence of aldosterone, as determined by CD69 upregulation and IL-2 and IFN-γ secretion. The enhancing effect of aldosterone was not caused by increased T cell polarization toward Ag-presenting DCs, nor to a direct effect on T cells, because activation induced by plate-bound anti-CD3ε was not affected by this hormone. Furthermore, MR expression by T cells seems not to be significant as compared with DCs or positive controls (Fig. 5A–C). Consistently, aldosterone diminishes the surface expression of PD-L1 on DCs, a negative costimulatory molecule involved in the suppression of CD8+ T cell activation (44). It is possible that downmodulation of PD-L1 induced by aldosterone would increase DC capacity to prime CD8+ T cells. Furthermore, Ab blockade of PD-L1 on the surface of DCs led to an increase of T cell activation (data not shown). Although DCs did not change the expression of activating costimulatory molecules, a significantly increased secretion of TGF-β and IL-6 was observed in response to aldosterone. All observed aldosterone effects could be suppressed by the MR inhibitors spironolactone and eplerenone. Because these molecules failed to block several nongenomic actions of aldosterone (48), it seems likely that DC response to aldosterone would be mediated predominantly by a combination of genomic and nongenomic effects mediated by MR. Consistent with this notion is the observation that DCs express MR and show p38 and JNK MAPK signaling in response to aldosterone. An important finding of this study was the remarkable ability of aldosterone to confer DCs with the ability to polarize CD4+ T cells toward Th17 phenotype, which is consistent with the increased IL-6 and TGF-β secretion shown by DCs in response to aldosterone. In the mouse, these two cytokines have been shown to be directly involved in Th17 cell differentiation (33). Moreover, Ab blockade of IL-6 and TGF-β secreted by DCs prevented Th17 polarization of T cells. Our data agree with previous studies describing the induction IL-6 expression in several tissues by a MR-dependent mechanism, as one of the proinflammatory manifestations of aldosterone (49). In addition, treatment with DOCA causes leukocyte infiltration and increased expression of TGF-β in the kidney (6). The reduced IL-2 secretion by CD4+ T cells observed in response to aldosterone-treated DCs is also consistent with the capacity of this hormone to promote Th17 differentiation, because IL-2 release has been documented to be detrimental for Th17 polarization (50). In addition, a significant increase in IL-17 secretion and intracellular staining by CD4+ T cells was observed in response to aldosterone-stimulated DCs, an effect that was blocked by MR inhibitors and blockade of IL-6 and TGF-β. The Th17 inducing capacity of aldosterone was also observed in an in vivo immune response. Treatment with the MR agonist DOCA, a physiologic mineralocorticoid in rodents, enhances the severity of EAE, an autoimmune disease dependent on Th17 cell activity (29, 47). In addition to higher clinical scores, DOCA-treated mice showed increased T cell and Ab responses to MOG. 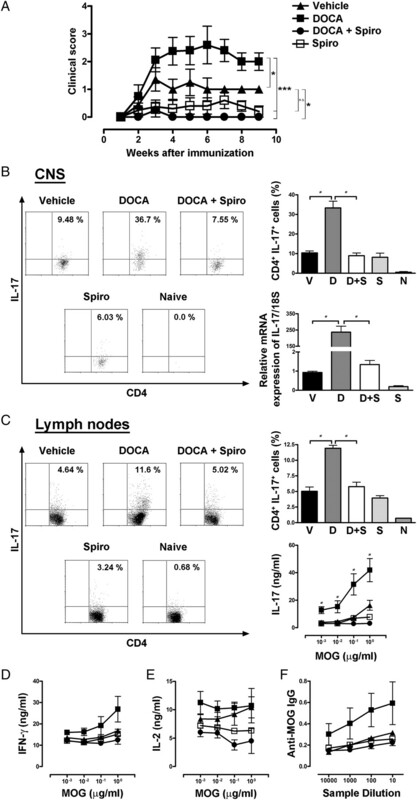 DOCA caused a significant increase in IL-17 secretion by lymph node T cells in response to MOG, an important proinflammatory cytokine that contributes in EAE pathogenesis (29, 51). Moreover, although we did not observe an increase in the number of total infiltrating CD4+ T cells, we observed a higher frequency of infiltrating CD4+ IL-17+ T cells in the CNS of DOCA-treated mice (Fig. 7B). These data suggest the notion that aldosterone can promote the polarization of CD4+ T cells into a Th17 phenotype during an in vivo immune response. It is noteworthy that all stimulatory effects of aldosterone were suppressed by spironolactone, both in vitro and in vivo, attributing a potential anti-inflammatory capacity to this MR inhibitor. In addition, IL-2 secretion by CD4+ and CD8+ T cells was inhibited by spironolactone alone (Fig. 1A, 6A). The direct T cell suppressor effect of spironolactone could be in part explained by its previously reported capacity to inhibit NF-κB activity (52), a transcription factor required for the expression of the IL-2 (53). Thus, the decrease on IL-2 production by T cells could contribute to the observed immune modulating capacity of spironolactone. Consistent with this notion is the previous observation that blockade of NF-κB activity can suppress DC function and T cell immunity and can contribute to preventing autoimmune responses, such as EAE and type-I diabetes (21, 40). Thus, the protective effects of spironolactone observed in patients with severe congestive heart failure through the randomized aldactone evaluation study, could be in part explained by an immunomodulatory effect of this molecule. Although these data support spironolactone as a potentially new immunomodulatory molecule, further research is required to consider it as a potential therapy for attenuating inflammatory and autoimmune diseases. In summary, the data presented in this study suggests that mineralocorticoids, such as aldosterone and DOCA, can enhance the capacity of DCs to activate CD8+ T cells and secrete cytokines that promote CD4+ T cell polarization toward a proinflammatory Th17 immune response. These newly described features of aldosterone would suggest that this hormone may also contribute to the pathophysiology of PAL-associated chronic cardiac failure by enhancing inflammation via Th17 immune responses. This work was supported by Fondo Nacional de Desarrollo Científico y Tecnológico Grants 1070352, 1070876, 1050265, 1050690 and 1050979; Fondo de Fomento al Desarrollo Científico y Tecnológico Grant D04I1075; INCO-CT-2006-032296; and Millennium Nucleus on Immunology and Immunotherapy (P04/030-F). A.A.H., P.A.G, and C.A.A. are fellows of Comisión Nacional de Investigación Científica y Tecnológica.
. 1997. Recent progress in understanding aldosterone secretion. Gen. Pharmacol. 28: 647–651.
. 1995. Prerequisite for cardiac aldosterone action. Mineralocorticoid receptor and 11 β-hydroxysteroid dehydrogenase in the human heart. Circulation 92: 175–182.
. 1997. Vascular aldosterone in genetically hypertensive rats. Hypertension 29: 45–48.
. 1998. Angiotensin II and cardiac remodeling. Mt. Sinai J. Med. 65: 104–107.
. 2003. Endothelin antagonism on aldosterone-induced oxidative stress and vascular remodeling. Hypertension 42: 49–55.
. 2008. Aldosterone and vascular inflammation. Hypertension 51: 161–167.
. 2005. Ligand-specific glucocorticoid receptor activation in human platelets. Blood 106: 4167–4175.
. 1999. Antagonism of the renin-angiotensin-aldosterone system and collagen metabolism in cardiac fibroblasts. Methods Find. Exp. Clin. Pharmacol. 21: 215–227.
. 2006. Rapid nongenomic effects of aldosterone on the renal vasculature in humans. Hypertension 47: 650–655.
. 2002. Aldosterone induces a vascular inflammatory phenotype in the rat heart. Am. J. Physiol. Heart Circ. Physiol. 283: H1802–H1810.
. 2004. Increased diagnosis of primary aldosteronism, including surgically correctable forms, in centers from five continents. J. Clin. Endocrinol. Metab. 89: 1045–1050.
. 2000. Primary hyperaldosteronism in essential hypertensives: prevalence, biochemical profile, and molecular biology. J. Clin. Endocrinol. Metab. 85: 1863–1867.
. 2003. Primary aldosteronism and hypertensive disease. Hypertension 42: 161–165.
. 1997. Aldosterone blockade reduces vascular collagen turnover, improves heart rate variability and reduces early morning rise in heart rate in heart failure patients. Cardiovasc. Res. 35: 30–34.
. 2003. Aldosteronism: an immunostimulatory state precedes proinflammatory/fibrogenic cardiac phenotype. Am. J. Physiol. Heart Circ. Physiol. 285: H813–H821.
. 2002. Aldosterone-induced inflammation in the rat heart : role of oxidative stress. Am. J. Pathol. 161: 1773–1781.
. 2003. 50th anniversary of aldosterone. J. Clin. Endocrinol. Metab. 88: 2364–2372.
. 2007. Role of the T cell in the genesis of angiotensin II induced hypertension and vascular dysfunction. J. Exp. Med. 204: 2449–2460.
. 2005. Aldosteronism and a proinflammatory vascular phenotype: role of Mg2+, Ca2+, and H2O2 in peripheral blood mononuclear cells. Circulation 111: 51–57.
. 2006. 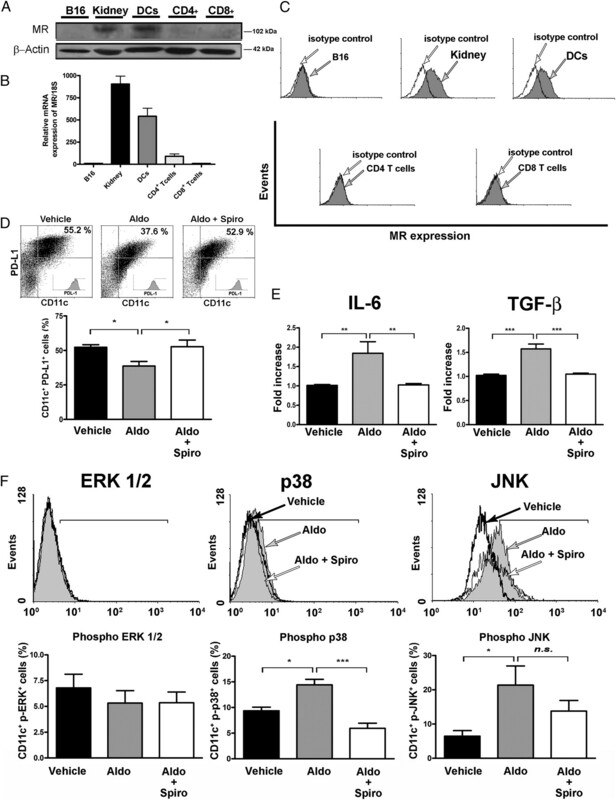 Inhibition of nuclear factor-κ B enhances the capacity of immature dendritic cells to induce antigen-specific tolerance in experimental autoimmune encephalomyelitis. J. Pharmacol. Exp. Ther. 318: 59–67.
. 2004. Salmonella escape from antigen presentation can be overcome by targeting bacteria to Fc γ receptors on dendritic cells. J. Immunol. 173: 4058–4065.
. 2007. Immune complex-induced enhancement of bacterial antigen presentation requires Fcgamma receptor III expression on dendritic cells. Proc. Natl. Acad. Sci. U.S.A. 104: 13402–13407.
. 2002. Inducing tumor immunity through the selective engagement of activating Fcgamma receptors on dendritic cells. J. Exp. Med. 195: 1653–1659.
. 2003. Tolerogenic dendritic cells. Annu. Rev. Immunol. 21: 685–711.
. 2006. Diversification of T-helper-cell lineages: finding the family root of IL-17-producing cells. Nat. Rev. Immunol. 6: 329–333.
. 2000. High levels of IL-17 in rheumatoid arthritis patients: IL-15 triggers in vitro IL-17 production via cyclosporin A-sensitive mechanism. J. Immunol. 164: 2832–2838.
. 2006. IL-17 plays an important role in the development of experimental autoimmune encephalomyelitis. J. Immunol. 177: 566–573.
. 2007. IL-25 regulates Th17 function in autoimmune inflammation. J. Exp. Med. 204: 161–170.
. 2008. The blood-brain barrier induces differentiation of migrating monocytes into Th17-polarizing dendritic cells. Brain 131: 785–799.
. 2007. Cutting edge: CNS CD11c+ cells from mice with encephalomyelitis polarize Th17 cells and support CD25+CD4+ T cell-mediated immunosuppression, suggesting dual roles in the disease process. J. Immunol. 178: 6695–6699.
. 1999. Fcgamma receptor-mediated induction of dendritic cell maturation and major histocompatibility complex class I-restricted antigen presentation after immune complex internalization. J. Exp. Med. 189: 371–380.
. 2006. Development of a panel of monoclonal antibodies against the mineralocorticoid receptor. Endocrinology 147: 1343–1348.
. 1999. A novel role for the major histocompatibility complex class II transactivator CIITA in the repression of IL-4 production. Immunity 10: 377–386.
. 1995. Further studies in deoxycorticosterone acetate treated rats: brain content of mineralocorticoid and glucocorticoid receptors and effect of steroid antagonists on salt intake. Neuroendocrinology 61: 117–124.
. 2005. Andrographolide interferes with T cell activation and reduces experimental autoimmune encephalomyelitis in the mouse. J. Pharmacol. Exp. Ther. 312: 366–372.
. 2001. The expanding B7 superfamily: increasing complexity in costimulatory signals regulating T cell function. Nat. Immunol. 2: 203–209.
. 2006. Regulation of T cell activation and tolerance by PDL2. Proc. Natl. Acad. Sci. U.S.A. 103: 11695–11700.
. 2008. Presence of suppressor HIV-specific CD8+ T cells is associated with increased PD-1 expression on effector CD8+ T cells. J. Immunol. 180: 7757–7763.
. 2001. Rapid activation of Na+/H+-exchange in MDCK cells by aldosterone involves MAP-kinase ERK1/2. Pflugers Arch. 441: 781–786.
. 2007. TGF-β and IL-6 drive the production of IL-17 and IL-10 by T cells and restrain T(H)-17 cell-mediated pathology. Nat. Immunol. 8: 1390–1397.
. 2005. IL-23 drives a pathogenic T cell population that induces autoimmune inflammation. J. Exp. Med. 201: 233–240.
. 2003. Nongenomic steroid action: controversies, questions, and answers. Physiol. Rev. 83: 965–1016.
. 2003. Aldosterone/salt induces renal inflammation and fibrosis in hypertensive rats. Kidney Int. 63: 1791–1800.
. 2007. Interleukin-2 signaling via STAT5 constrains T helper 17 cell generation. Immunity 26: 371–381.
. 2007. Interferon-γ-oligodendrocyte interactions in the regulation of experimental autoimmune encephalomyelitis. J. Neurosci. 27: 2013–2024.
. 2006. Spironolactone induces apoptosis and inhibits NF-kappaB independent of the mineralocorticoid receptor. Apoptosis 11: 2159–2165.
. 1996. T cell antigen receptor signal transduction pathways. Cancer Surv. 27: 165–175.